- Protects your waterproof camera from sinking while you are snorkeling or swimming. 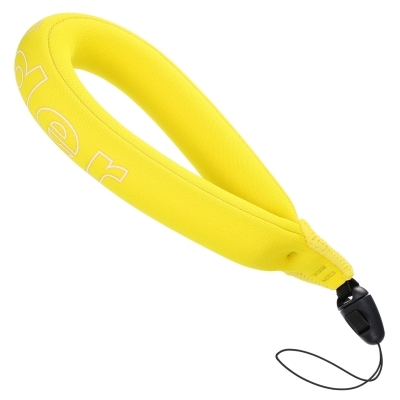 - Easy to spot in the water from far away with the bright yellow color in case you drop it. - Made from soft, durable material, providing a secure solution for carrying your waterproof devices. - Easy to use and allows you to easily disconnect your camera from the strap. A floating, quick release style strap for all your aquatic photography needs. The bright color material makes it easy to find in the water to avoid being lost. The bright colored strap is easy to see in pools, lakes, oceans, or other bodies of water. It provides surfers, kayakers, and other active swimmers with the ability to strap the camera to their arm, freeing their hands when not taking photos.